QUESTION #1 - If I'm playing Mario Kart on my 3DS, can I play the game with other players if they are using standard DS systems? Will the 3DS support multiplayer DS games in general? QUESTION #2 - When it comes to concepts like coins or the ability to play MP3s, are developers free to use those concepts in any way they choose? ANSWER - Yes, it is up to each individual developer to decide whether or not they would like to implement the various features the system has to offer. QUESTION #3 - Could a developer conceivably use the MP3 playback concept to allow users to have custom game soundtracks? ANSWER - The system is capable of doing that, though it will be up to each individual developer to decide whether to allow it. QUESTION #4 - When it comes to StreetPass functionality, are you able to control which games StreetPass can effect? Can you manage that type of access on a game-by-game basis? ANSWER - StreetPass functionality will not be active until the user chooses to activate that functionality. Once the feature is active, users must also set up StreetPass data on a game-by-game basis. Even if a game is compatible with StreetPass, it will not start sending data until the player chooses to do so. Owners can also use parental controls to turn off the StreetPass function entirely. QUESTION #5 - What's the maximum size SD card that can be used in the 3DS? Is there a limit? ANSWER - Every system comes with a 2GB SD memory card (though owners can provide whatever size they like). QUESTION #6 - To confirm – the 3DS touch screen does not support simultaneous, multiple-point input, correct? QUESTION #7 - Are you able to play the system while charging using the cradle or the AC adapter? Is one somehow more effective than another? ANSWER - Users are able to play the Nintendo 3DS while charging, regardless of whether the system is plugged into the Charging Cradle or AC adapter. Both are just as effective. QUESTION #8 - Is the Internet browser for the 3DS still Opera-based? Is it enhanced in terms of functionality over previous Nintendo system browsers? ANSWER - A browser will be made available via a system update after launch. We will be revealing more information closer to launch. QUESTION #9 - Can you detail how friend codes will work when you're with friends in the same Wi-Fi area versus when you are separated in different regions? ANSWER - When playing games, friend codes will work the same, regardless of where the players are located. 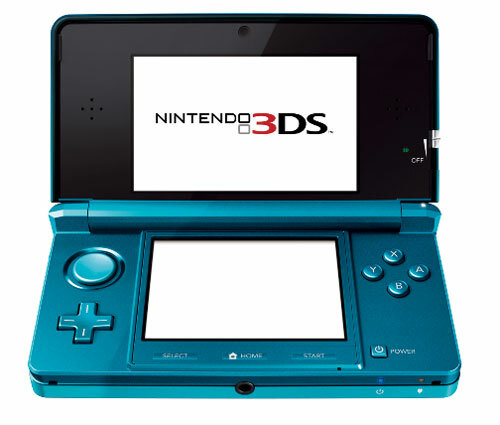 The Nintendo 3DS only requires gamers to enter one code for the hardware; the codes are not software dependent. Once users have traded hardware codes, they can check their friends list to see which of their friends is online, what they are playing, and can jump into online play for compatible games much quicker than today. The only difference will be the ability to exchange codes. Friends who are separated by distance will need to exchange codes once and manually enter them. Friends who are in the same room can automatically swap codes wirelessly, with nothing to enter. QUESTION #10 - Can you clarify the presence of the e-Shop? It's available in May and only via download? ANSWER - The Nintendo eShop, the ability to transfer Nintendo DSiWare games to Nintendo 3DS and the Internet Browser will all be activated via a worldwide system update which is scheduled for late May. QUESTION #11 - How many megapixels are the 3DS cameras? Is it theoretically possible to record video – in 3D? ANSWER - The camera resolution is the same as the screen resolution: 640x480. Still images only. Nintendo 3DS does not record video at present. However, Mr. Miyamoto has stated that recording 3D video is one of his ambitions for the product moving forward. QUESTION #12 - What Wi-Fi security settings are compatible with the 3DS? ANSWER - The Nintendo 3DS supports WPA and WPA2 Wi-Fi security settings. QUESTION #13 – Can Play Coins be used to buy either in-game items or things from the e-Store? ANSWER - We anticipate Play Coins to be used in a variety of different ways in-game—unlocking bonus content is just one example. Play Coins will not be used in the e-Shop. QUESTION #14 - Does the 3DS support voice chat? ANSWER - We do not have anything to announce at this time. QUESTION #15 - Once a friend code has been added or selected, do you see them by their name or nickname? ANSWER - Similar to the way Friend Codes work on Wii, once friend codes are exchanged you see your friend listed by the nickname assigned to their system. QUESTION #16 - Are you able to message your friends in addition to seeing what games they are playing? Do you guys see any answers to questions that you didn't know before? I was kind of wondering about the 3DS being able to recognize other older DS systems via Wi-Fi and I 'm glad that it will not be limited to only other 3DS systems. Yes 3DS does have "Download-Play" this was confirmed long long ago. Can You Play MP3 or WMA Files On The 3DS, Or Is It Still Only AAC?